In case people haven't read my post on grounding in my KSO's I'm just going to say. If I can't go barefoot I find it easier to ground my energy when I feel the ground beneath my feet and vibrams are usually perfect for that as they simulate a barefoot feel with the added protection. 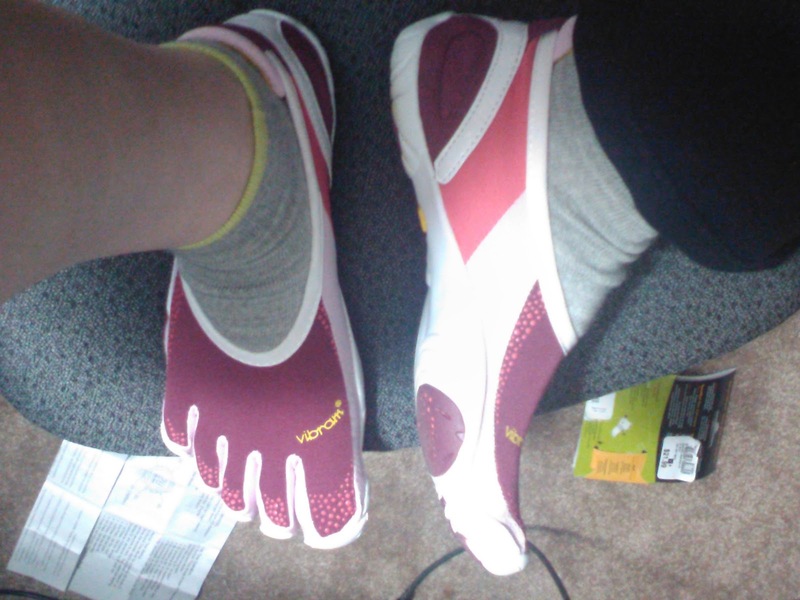 Yes other minimalist shoes will probably work just the same but I own vibrams because I like them. The website for vibrams is here. My new Jaya's from vibram fivefingers came in yesterday as well as my smartwool toe socks from sportschek and I have to say I'm loving the socks but the shoes are going to take a little getting use to. I've been wearing my KSO's for about a year now and with the strengthening of my feet I have actually outgrown them somewhat. I stretched them so I can still squeeze into them but they are tight. Remeasuring my feet again I am still surprised to have found that I went up 3 vibram sizes. 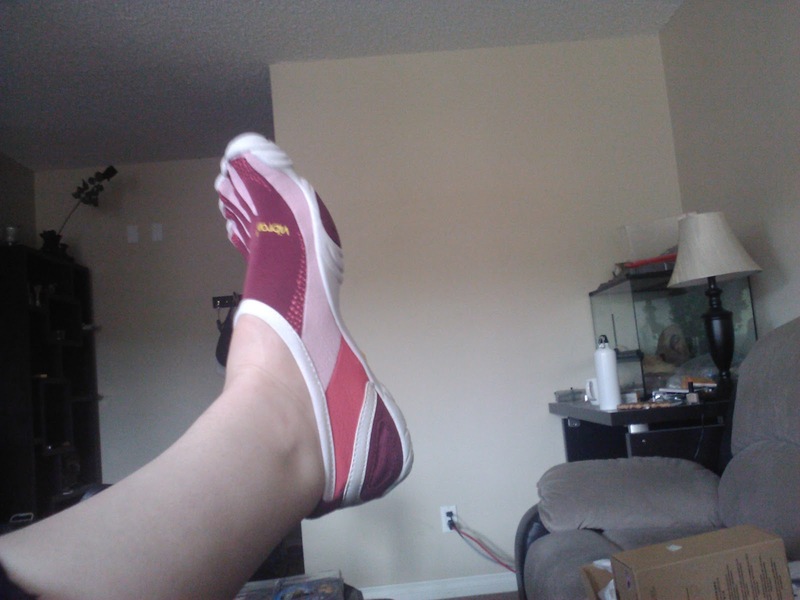 So I bought the Jaya's in plum/pink/white, L said to try a new style and they're not bad. The Jaya's are large enough to fit with the socks on but not too large to be uncomfortable without the socks, it feels weird but I quickly got over that feeling after I realized that I wasn't getting sweaty like I normally do. I was warned that the Jayas were a bit different in that the bottoms were meant for inside use, looking at them now I see that the white stuff is a foam like material and the plum disks are a harder type of rubber which is meant for grip. I'm not very fond of the foam but it does make them very light on the feet I forgot I was wearing them last night, though I prefer the feel of the ground which was a little muted when in comparison with my KSO's. Maybe after a wear down period they will have a better barefoot feel but as of now I'm not that impressed with the bottoms of these. Lighter than KSO's but not as sensitive. The colour selection of these is fantastic, normally I can only say that I like 1 or 2 of the colour variety when it comes to vibram but the Jaya's are the exception. I love the style though was a bit sad to see that the vibram website did not have any in my size, I had to order through sportschek. I have small feet but I still would love it if they restocked their north america site more often. How are they to expect to sell more product if they don't restock is beyond me but I watched their site for 2 weeks (nearly 3 weeks) before going to sportschek and this is not the first time I have noticed or people have told me about vibram not restocking. 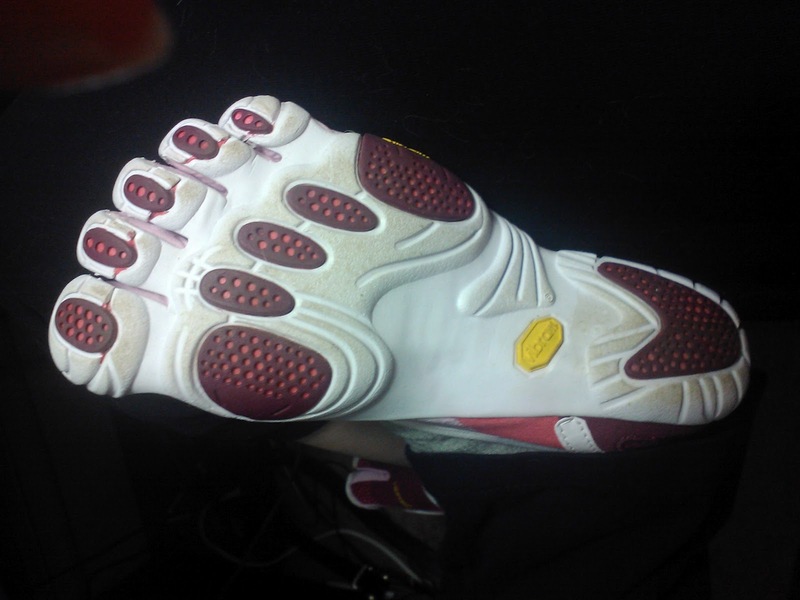 (hint hint, Vibram you have people wanting to buy but can't because you never have stock!!!) *snickers* I doubt vibram will look at this blog anyway, just google them and see the massive amount of blog posts they have mentioning them. Putting these on was an easy task in comparison to putting on the KSO's which seemed like a chore in itself some days (worth it though). 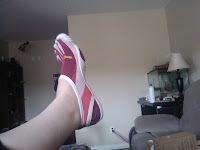 I have yet to find any hotspots on the Jaya's and hope to soon wear them down so that they are more flexible. Don't get me wrong, they are still fairly flexable but I'm use to year old KSO flexable where I could roll them up and stuff them in a coat pocket. I can't fit my Jaya's in a coat pocket yet. All in all I'm left with a good impression on the socks and an ok impression with the Jaya's. The Jaya's are meant for indoor activity and I will probably use them as a lounge wear and for quick outings to the store or friends. I will probably wear them to yoga today as well. However since the pricetag on vibrams is so high I may have to wait 6 months to a year to buy my next pair to replace my KSO's for more active outdoor wear. 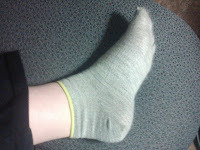 These are personal opinions, smartwool and vibram did not pay me or supply me with anything that I did not buy myself. I spent over $120 so now I'm kinda broke for now. 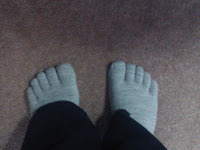 All pictures are of my own feet while sitting at my computer. Ah and yes I do remember that today I'm supposed to post a recipe of the week for RYH. I'm working on that, I just don't know what to make I'm just lazy today. good grip without ripping into the mat and less foot sweat. This review was really helpful! I've been contemplating getting a pair of Vibrams for several years, but haven't quite gotten up the gumption to do it. Have you had improvements in things like back and knee pain, etc. like their website claims? I do highly recommend minimalist shoes of any kind with proper training, and I cannot stress the proper training part enough. My sciencey part will pop out during this and so I ask that you forgive me for the following wall of text. If you want to skip the sciencey stuff (I suggest you don't as it is helpful in a way and tells you how not to get hurt) my health experience is near the bottom I'll put an * where it is. Minimalist shoes have no padding and zero drop between the heel and toe, this means that there is no protection for the heel and the usual way of walking heel to toe is dangerous. Humans have only started walking heel to toe recently (since we started wearing shoes) and since we did not evolve with shoes (or if you are a creationist-> we were not made with shoes)wearing the shoes that change our gait also changes or alignment. Walking heel to toe gives you body more of a shock when walking but because of the padding in shoes we don't notice it as much. We do damage to our feet and body without realizing it. Now when you walk with minimalist shoes or barefoot it will hurt to strike with your heel, which is a good thing as we need pain to tell us when we are doing something stupid. The joints in your legs and feet are formed so that we were meant to walk a little forward, either flat foot or slightly on the front pads. Walking with the more natural gate will use different muscles (you will feel muscles you never knew you had!) So take it really slow. during the transition time between regular shoes and minimalist you are more likely to acquire fractures, sprains and strains because you are not use to using those muscles and are not use to walking differently than you have your entire life. Remember how long it takes a baby to learn to walk? That roughly the time it'll take a person to fully transition themselves without hurting themselves. Now the reason I like vibrams better, they spread your toes which are used for balance and are not made to be squished together. Second posting with personal experience and yes I still sound like a crazy convert. ***Now as for if I have seen improvements since wearing them. I also walk more and have become more healthy in general since I no longer have pain holding me back. But the transition was hard at first because I knew that I could not start out with the vibrams like I would with a regular shoe and I was not use to walking without arch support so my arches hurt while I was building up the muscle. Sorry for the sciency talk earlier, I looked up months worth of research and even had my own test subject (L had them for years before I even met him). I also knew the basics of how the human body is supposed to work because of a few too many years doing biology and anatomy. I do suggest looking at a few independent papers yourself instead of listening to me though as I am a convert to this thing and I may be bias because of my own individual results and the results of friends I know. I just realized that I spelled orthotics wrong because of spell check...twice!